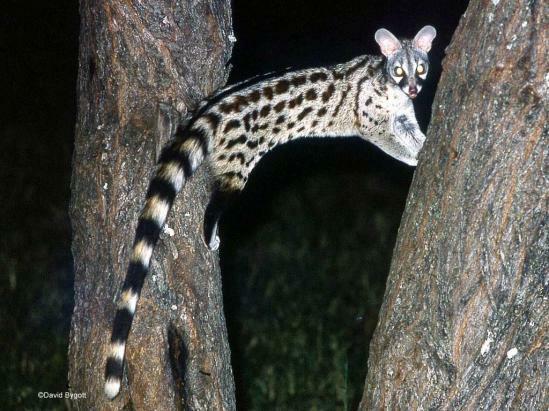 The Genet is a carnivore whose varied diet includes large insects, small mammals (above all, rodents), worms, birds, reptiles and amphibians, but also occasionally fruit and seeds. Its cranium is small, flat and elongate, with a short pointed muzzle. It has a short but prominent sagittal crest on the upper part of the skull to which the temporal muscles ? a masticatory muscle that moves the mandible ? are attached. It has the typical dentition of a carnivore, that is, secodont and specialized in cutting and shearing the flesh of its prey with the upper P3 (third premolar) and lower M1 (first molar) carnassial teeth. It has 40 teeth with the following dental formula: I 3/3 C 1/1 P 4/4 M 2/2.